By now, most of you will have heard about the mass shooting of LGBTQ people in Orlando at Pulse nightclub. It was a horrific act of violence that left 49 of our people dead and 53 wounded. I use the phrase “our people” intentionally. I never knew these people. Most of you will not have known the victims either. But I nevertheless (as I am certain many LGBTQ people do) feel connected to the victims. Our community may be at times divided. There may be times when our connections to one another seem superficial. At the end of the day, however, we are and need to be in this together. That means allies too. There are a few troubling responses that have come from this attack that we all need to be vigilant about. One is the type of messages that simply read “prayers and thoughts are with those affected. When you read tweets from politicians and others that say their prayers and their thoughts are with the people of Orlando, but fail to mention who these thoughts are for, they are proving their cowardice. They cannot bring themselves to actually declare solidarity with Gay, Lesbian, Bisexual, Trans, Queer, Asexual, Intersex, and Questioning people. In 2016, is should not be courageous to speak those names, those words. It is certainly cowardice and political thinking that would cause people to shy away. Our Orlando LGBTQ family was the community targeted. The least people can do is name us. The least they can do is acknowledge that LGBTQ people died in horrific violence in what was supposed to be a safe queer and trans space- again. Further, we should also be acknowledging that a large number of LGBTQ people of colour died. It was Latino night at Pulse and as such, we are talking about a group of people who experience multiple vectors of discrimination that suffered the most and will surely need our united support in the coming days. The Gay Heritage Project that ran at the Citadel theatre in Edmonton and traveled across Canada a few months ago reminded us that our heritage is a heritage of violence. Being subject to violence is our LGBTQ people’s birthright thanks to bigotry, hatred, & heterosexism. When politicians choose not to name us, they are erasing us from our own history and making it harder to show people what we as people and as a community face on a regular basis. Some of this erasure is unintentional- habits that politicians get into in order to stay in the public eye and show support. It is all too easy to simply say “thoughts and prayers” without it meaning anything at all without actually talking about the actual people who were hurt. There is a second component of the erasure that is more troubling however. This is the resurgence and justification of islamophobia. I need to be very clear here. The one thing we must not do, the one thing that is unforgivable for our community to do, is to allow this attack and all the pain we are feeling to be used to hurt another marginalized community. We must resist the urge to blame Islam and Islamic people. The people who hate us as LGBTQ people often hate them too. I am speaking here of people who want to build walls and want to bar groups from a country and the people who think that LGBTQ people are sick, or perverts, or predators, or all of the above. If a person hates based on race, it is in my experience, likely for them to hate sexual and gender minority people too. And all of this is not yet even addressing the many many many LGBTQ people who are also practicing Muslims who over the coming weeks are at a very high risk of being shunned for no good reason by both the dominant North American culture and our queer and trans communities. They are our friends, and our family, and a part of the “our people” that we must so desperately protect. We are all subject to the same power struggles, the same fear, and disgust, and judgement, and that links us in a way that is incredibly important. We are smarter than being divided to serve hatred. We have seen the face of prejudice and hatred and must never allow ourselves to be used to hurt others as we have been hurt. We must also not allow this event to be occupied and morphed into some kind of anti-Islam and pro-America event. I am however sad to say that this has already started. People who have fought long, hard, and sometimes violently against basic LGBTQ rights are already claiming a stake in this attack on the basis of “our way of life”. 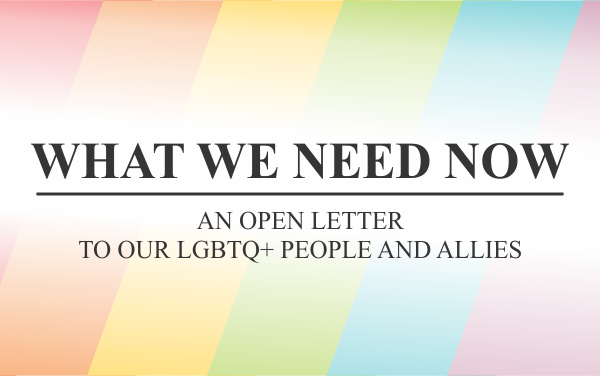 They have laid claim to our community’s pain – to the pain of the Orlando LGBTQ community. It is nice to see some solidarity here, but it is not their pain, their safety, their lives. To claim that LGBTQ in America and even more so LGBTQ people of colour in America (and Canada for that matter) have been treated by the general public as part the “our way of life” the dominant culture as they claim is a stretch at least and blatant lie and manipulation in reality. Only in the last 10 years can this be even marginally true. The people outside the LGBTQ and allied communities making the claim that they are the victims that they have a stake and then attack another marginalized group are usurpers. They feed on and contribute to the erasure I mentioned above. They do so to satisfy their own ignorance, fear, and hate. This is not accidental or benign. These people are taking ownership of the pain and suffering of the people who were killed for their own political and religious agenda. That agenda is to wage war on Islam. It should be noted, for those who do not know, that many Muslim people are currently celebrating Ramadan, a tradition that teaches people to consider the needs of others. These are not the faces of our enemy. And importantly, as has been the case every time some lunatic representing a deranged and extreme interpretation of Islam has committed violence, our Muslim friends, family, and neighbours have actively called out, condemned and educated on the evil represented by the violence that has been done erroneously in their name. Yes, the person who committed the assault appears to have identified with radical Islam. Yes this person probably carried out the attack on our people with a religious intent. But he does not represent Islam, he does not represent my Muslim friends and colleagues. And his actions in no way justify lashing out at an entire people. Again, we are smarter than that. As a community, we need to support each other. We need to talk about our feelings. We need to engage in good self-care (meaning we must work to maintain and safeguard our own mental health). Most importantly though, we need to remember the humanity of it all. We need to see people as people. We need to talk about our people as a people. We need to have politicians and pundits talk about the actual people impacted, by name, not just as “those affected”. AND more than anything, and with great passion, we must push back at those who want to seize on these horrific days as a way of uniting people in fear and hatred. Peace, humility, compassion, and humanity. That is what we need now. Previous : Floats and Flags: Activism or a Capitalist Demand? Bryan Mortensen is the Executive Director of the altView Foundation. He holds an arts degree Majoring in English and minoring in Philosophy. He generally uses male pronouns, but won't be offended if you call him ma'am. Thank you to K. and J. for your work on editing this piece.